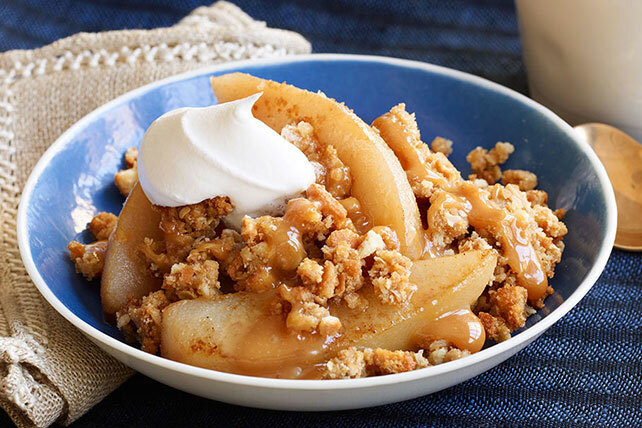 Pair up pear with decadent caramel flavor when you make this Caramel-Pear Crisp. Top your delicious Caramel-Pear Crisp with COOL WHIP LITE for a sweet Healthy Living dessert perfect for all of your upcoming parties. Combine oats and sugar in medium bowl. Cut in butter with pastry blender or 2 knives until mixture resembles coarse crumbs. Stir in wafer crumbs. Place pears in 1-1/2-qt. casserole sprayed with cooking spray; top with crumb mixture. Bake 35 to 40 min. or until pears are tender and topping is golden brown. Cool 15 min. Meanwhile, microwave caramels and milk in small microwaveable bowl on HIGH 1 to 1-1/2 min. or until caramels are completely melted, stirring after 1 min. Drizzle caramel sauce over dessert just before serving; top with COOL WHIP. Don't worry if your pears are a bit on the firm side - they will soften nicely when baked. The best varieties of pears for baking are Anjou or Bosc. If crumb topping starts to overbrown, cover the dessert loosely with foil for the last few minutes of the baking time. At 200 calories per serving, this easy-to-make fruit-based dessert can fit into a healthful eating plan.